Also, Prelude to a Drama; the Romantic Suite. 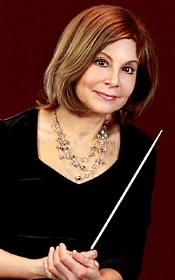 JoAnn Falletta, Berlin Radio Symphony Orchestra. Naxos 8.573821. Here's another of those composers whose music was once very popular but then fell into disfavor, whose name is hardly recognized anymore. Franz Schreker (1878-1934) was an Austrian composer and conductor who at one time in the first part of the twentieth century was among the most-famous living opera composers in the world, second only at the time to Richard Strauss. But he had the misfortune to live at a time of rising anti-Semitism in Austria and Germany, and by the 1930s because he was Jewish his music was banned by the Nazis, and he lost his position in the music world. Fortunately, we have people like JoAnn Falletta championing his work. On the present album she leaves her familiar Buffalo Symphony for the Berlin Radio Symphony, which is perhaps a tad closer to the source, and presents three of Schreker's purely orchestral pieces. The program begins with Prelude to a Drama, completed in 1915 as a concert overture to Schreker's opera Die Gezeichneten ("The Branded" or "The Stigmatized"), which the booklet note describes as "a lurid drama involving murder and madness." Although Schreker worked during the onset of the modern era, his roots were still firmly planted in the Romanticism of the eighteenth century with Wagner and the early Richard Strauss, tempered by the emerging impressionism and expressionism movements. The Prelude is filled with unabashed emotionalism and melodrama, yet Ms. Falletta maintains a dignified approach, making it all seem perhaps more substantial than it really is. What's more, the Berlin orchestra plays with such a sophisticated charm, we can almost forgive the music of some of its excesses. 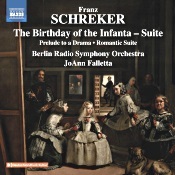 Next comes the album's title piece, Der Geburtstag der Infantin ("The Birthday of the Infanta"), a theatrical pantomime Schreker wrote in 1923. Its subject matter is even more bizarre than Prelude to a Drama, the composer basing his story on Oscar Wilde's "tragic tale of an ugly dwarf who dies of a broken heart." In ten sections, The Birthday is the longest piece on the program, and it, too, gets pretty emotional. Ms. Falletta makes the most of it, however, with a flexible rubato and a moderate use of contrast to keep things moving at a steady but not excessive pace. Like the Prelude, it's fun stuff, if overlong. Moreover, there are smoother, richer segments, as in the opening "Reigen" (roundelay or round dance) that are quite lovely. Conversely, there are also long stretches of bombast. Still, it's quite colorful, with surprisingly playful interludes mixed in with the seriousness, and Ms. Falletta presents it persuasively. The third and final piece on the agenda is the four-part Romantische Suite ("Romantic Suite") from 1903. It is a more lyrical, subjective, abstract work than most of the program music that precedes it on the album. Of the three pieces Ms. Falletta offers here, I found the "Romantic Suite" the most attractive. At about twenty-five minutes it does not overstay its welcome, yet it seems to pretty much encapsulate everything Schreker was capable of doing. Falletta maintains a grand, sweeping Romantic mood throughout, concluding with a rousing dance. In all, while Schreker probably didn't mine much new territory here nor create much that listeners will take with them for long, he did provide an entertaining assortment of styles, much of which is hard to dislike. More important, Ms. Falletta gives us a refreshingly clear-eyed glimpse into a long-forgotten composer who deserves a second look. Producer Wolfram Nehls and engineer Ekkehard Stoffregen recorded the music at the Grosser Sendesaal des RBB, Berlin, Germany in June 2017. The sound is natural, as opposed to overly close, bright, edgy, or distant. Speaking of distance, though, there is a good sense of depth to the orchestra and a fairly wide stereo spread. The frequency response does not favor any part of the spectrum too much, unless you count a sometimes prominent peak in the lower treble range. Detailing is good, with instruments standing out well yet still being reasonably warm and resonant. Dynamics appear a little too constricted for absolute realism, and bass could be deeper, so it's really not what I'd call audiophile sound; just pleasantly listenable, if a tad soft, sound.